Parsley was an unusual ingredient required by Joanne Chang’s split-pea soup recipe, but it only required three tablespoons. (I suspect I used substantially more than that, because, well, I had substantially more than that.) So on Monday afternoon, I opened up my refrigerator while making my shopping list — it being Martin Luther King, Jr., Day, a federal and MIT holiday — and contemplated what I might do with all the parsley I still had left over. (And that was having already bought the smallest bunch of flat-leaf parsley on offer!) I know of only one recipe that uses a significant amount of parsley: Ethan Becker’s meatloaf, from his much-maligned 1997 revision of Joy of Cooking ; it calls for two thirds of a cup. Aside on the history of this recipe: I have four different editions of Joy (which, for those furriners reading this, is one of the three Standard American Cookbooks, and the only one of the three my mother owned, so it’s the one I learned to use). The last revision made during Marion Rombauer Becker’s lifetime was published in 1974, and by the 1990s, it was clearly getting quite dated. The 1997 edition was a significant revision, with a lot of material taken out, and a lot of new material added in; it also changed some long-standing typographical constants. Joy -74 has two main meatloaf recipes, plus a third recipe, “Meat loaf cockaigne”, which used cream of mushroom soup as an extender. (“Cockaigne” was the name given to the Becker family home, and recipes so identified were Marion Becker’s personal specialties.) Joy -97 drops all three recipes, and adds a completely new recipe, with one variant (“Southwestern meatloaf”). The outcry over the 1997 revision was such that, in 2006, a new revision was published, restoring most of the material dropped from the 1997 edition, and now set in Frutiger rather than Joy -97’s Minion, the former being a sans-serif typeface similar to that used in Joy -74. Joy -06 includes the recipe from Joy -97 as “Meatloaf I”, and the “Meatloaf II” recipe from Joy -74, but not “Meat loaf cockaigne” nor Joy -97’s “Southwestern” variation. 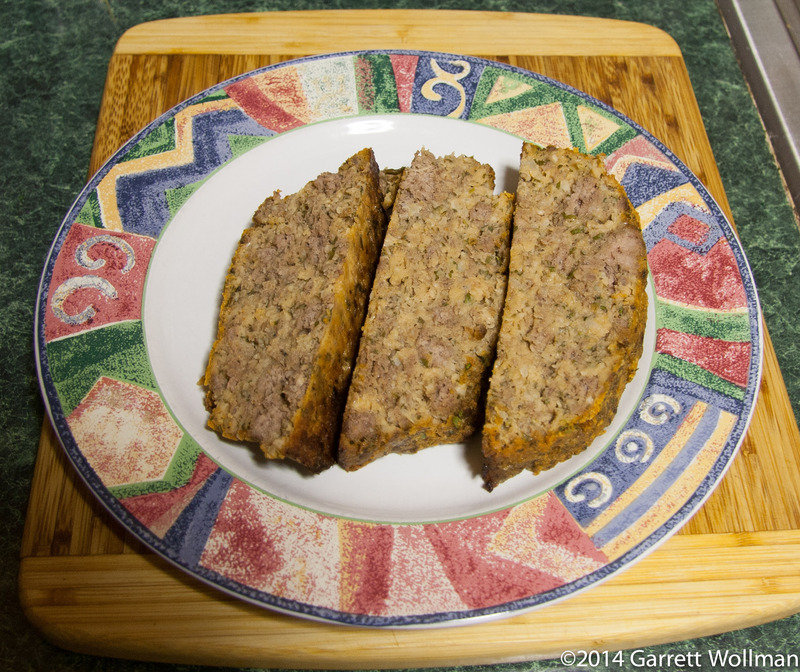 In any event, I decided to make Joy -97’s regular meatloaf, as a way of using up all my remaining parsley. 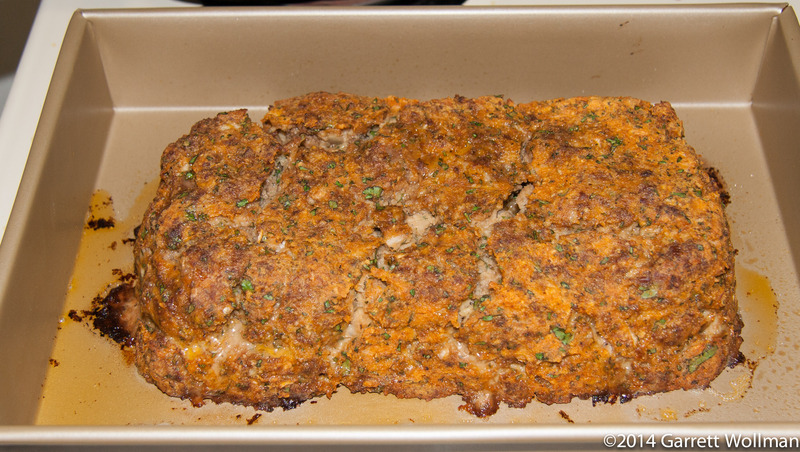 Unlike many other meatloaf recipes, this one is all-beef. (A common combination in historical recipes is equal parts beef, pork, and veal; I’ve also seen two-meat recipes, and some with lamb in place of the veal. 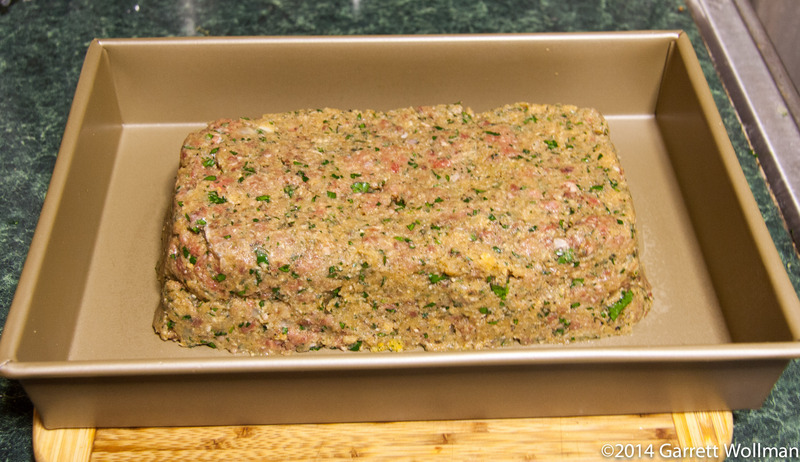 There are also other single-meat loaves, like ham loaf and turkey loaf, which are much less popular than they once were, although the latter has made a comeback, as “turkey meatloaf”.) In addition to the parsley, it also takes breadcrumbs, ketchup, thyme, salt, pepper, a cup and a half of chopped onion (I actually used grated onion as I have little patience for mincing that much vegetation! ), and a whopping three whole eggs. The recipe doesn’t specify a precise order of operations, but I figured that the extender in this recipe was going to function effectively like a panade, so it would make sense to mix all the non-meat ingredients together before combining with the meat, to ensure even distribution. 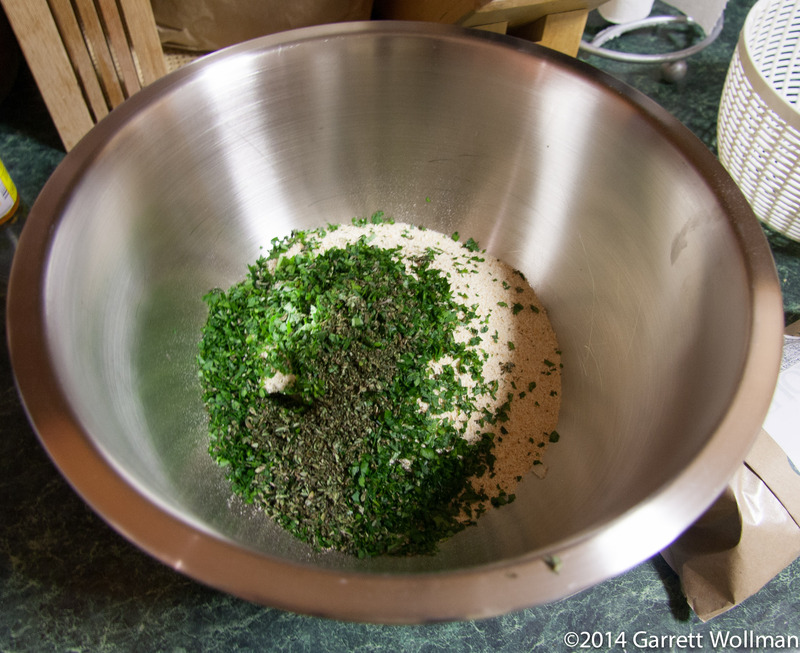 I’ve made this recipe in the past without doing that, and it can be very disconcerting to have a clump of parsley show up in the middle of the meatloaf. With three eggs and 2/3 cup of ketchup, this makes a very sloppy mixture indeed! The recipe cautions not to overmix (a caution I also recall hearing from Alton Brown), and the meat is mixed with the other ingredients by hand; whenever I’d made this recipe (and this time would prove no different), I’ve always failed by undermixing rather than overmixing, as the photos below will show. That’s a rather unappealing looking bottom, better flip it back over! The perils of under-mixing: note the eggy bottom, as well as chunks of solid meat, which the pseudo-panade extender should have prevented. 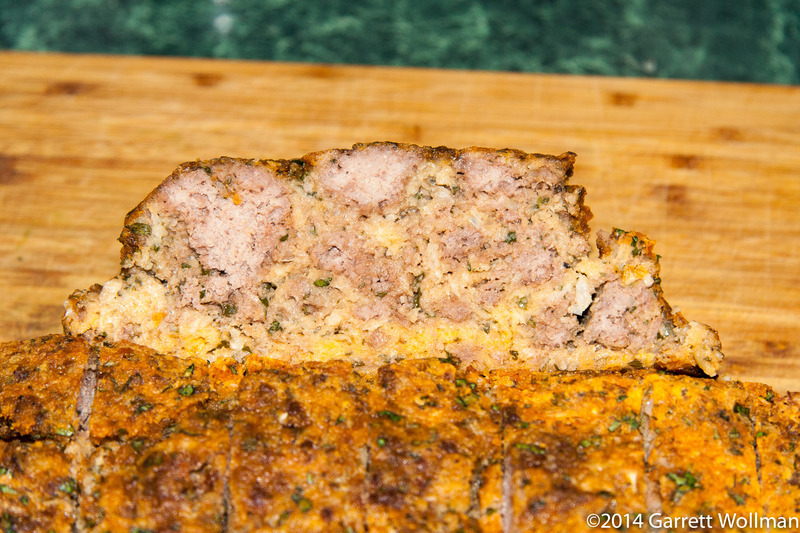 This entry was posted in Food and tagged beef, ground beef, Joy of Cooking, meat, meatloaf, parsley, recipe. Bookmark the permalink. 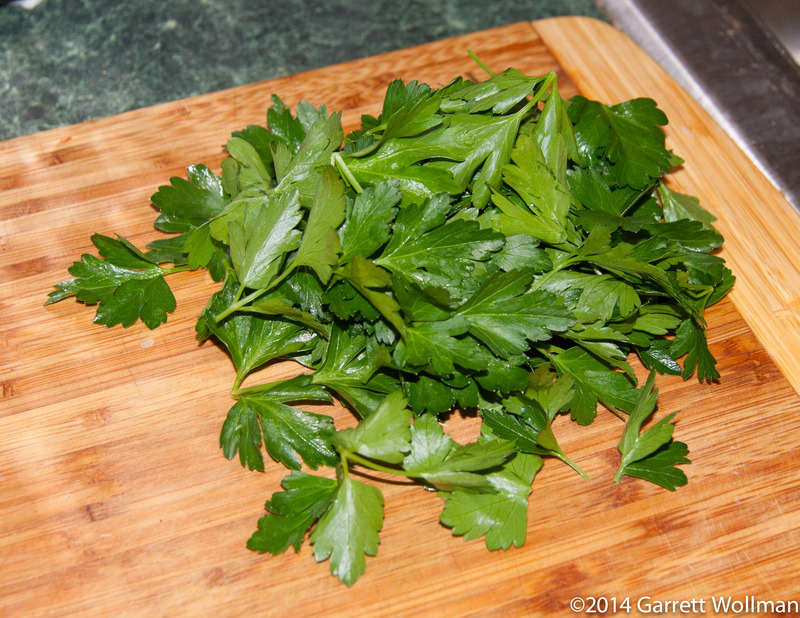 3 Responses to OK, I have three fourths of a bunch of parsley left. Now what? Ah! You know America’s Test Kitchen! I thought nobody watched that…! My understanding is that “America’s Test Kitchen TV” is the top-rated cooking show on public television. But note that it’s just one of the company’s numerous media ventures. I don’t think anyone watches it in Canada.At least not anyone I’ve mentioned it to. I’m addicted. It’s a guilty pleasure, because I find it so damn cheesy.